As the kids get older, I’m starting to work more. Hold on. Let me step back for a second. It’s difficult for me to work more than I do as a parent. What I mean is that I’m doing other activity besides changing diapers and cooking toddler food. Yes, I had a life and job before they came and I’m very interested in resuming some of those activities again. Very. So this past weekend, I went off to a business event. I left early on Friday morning and returned in time to pick up the kids from daycare the following Monday afternoon. I was missing in action for almost 4 full days. I didn’t tell the Worm that I was leaving and I didn’t tell him when I was coming back. He’s at an age where he understands quite a bit, but the man-made concept of time doesn’t trigger much neuronal activity. So what did I do? I made the choice not to tell Worm about my trip. I mean, why would I want to stress the little guy both before I leave as well as while I’m gone, right? Right? Please tell me I’m right. Worm and I are best friends. Every day, he tells me that he loves me. Every day, I hug him and let him know how proud I am of him. Every day, I tell him that I love him in a way that he could never question. Except for last weekend. And Worm wasn’t quite himself. Sure, his mother was there to hold him, and squeeze him, and love him. But that’s her relationship with the Worm, not mine. She can’t take the place of me, just as I couldn’t take her’s. The human heart just doesn’t allow us to replace one another that way. So this week when I returned to my normal daddy duties and doodies, I was reminded of how much a part of that little boy’s life I have become. I’m a fixture to the Worm. Not like a lightswitch, but more like a TV with Curious George episodes playing on it. I’m important. Worm’s been afraid to take his afternoon nap, and though he hasn’t said it, I believe he’s fearful that I won’t be home when he wakes up. During what should be his nap time, he pokes his head out in the living room every 10 minutes to check on me by saying “I just want to give you a hug.” or “I want to give you a mooch.” This has been going on for over an hour a day. He fears that if he closes his eyes for too long, I’ll disappear. Worm’s still not quite recovered from my trip. (Neither am I, by the way.) So I’m working to repair the damage I did by supplying extra hugs and kisses to him. I don’t know where to go with this one. This is a tough spot. I know that I’ll be doing more weekend events, but I’m still not sold on telling Worm that I’ll be gone since he only understands two forms of time: right now and not right now. Maybe I’ll just give up on working and retire now. Maybe I’ll take the Worm with me to events to run the cash register or something. Or maybe I’ll help Worm disconnect from emotional suffering by getting him a cell phone. It’s official. The Worm has wiggled his way out of his wormhole and into the still of the night. I’m assuming that the majority of crib escapes happen under complete darkness. As a parent, I imagine rolling over in the middle of the night and opening my eyes to note the time on the bedside clock. Instead of numbers, I see a set of piercing eyes hovering 3 feet off the ground. I jump to the other side of the mattress and huddle behind my wife to protect my body and limbs from attack. I look harder and see disheveled hair and a shiny object. 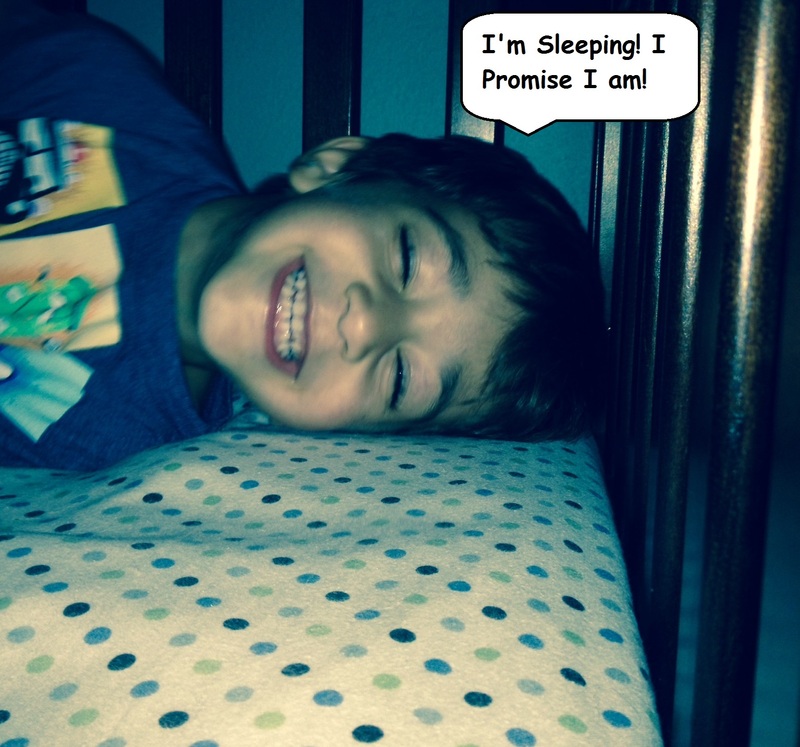 I yelp…in a manly way…as a signal for everyone in the house to wake up and run for safety. Then I realize that it’s only the Worm, who is standing there clutching a night-night book with a reflective mirror cover. It’s not Chucky coming to take my life, but my own child who has broken out of his cage crib. Worm’s clever. He’s been milking this crib thing for all it’s worth. The dude’s so big now that if he leaned over the railing, he’d probably fall out. I tried to teach him how to climb out about 6 months ago, but he wasn’t having any of it. He feigned weakness and lack of coordination. It was a very believable, Oscar quality performance. I bought it hook, line, and sinker. I left the idea alone afterwards. Realistically, there’s no reason for him to leave, once he’s put to bed. Every beckon call is immediately answered with a “Yes, sir? More ice for your water? Could we bring you some games for your evening pleasure? Or perhaps a night time book? A song? 10 touch-me’s? A foot rub? Maybe we could offer you some freshly peeled and sliced apples?” When he calls to use the potty, he’s answered within seconds. Sometimes, he’ll get carried straight to the bathroom toilet, his feet never having to touch the floor. Some people will pay big money for this kind of room service…and I think he knows he’s getting it for free! He’s 3 and a half now. It’s probably about time for him to move out of the crib and into a bed. Some people think we waited too long, others think we should wait until he’s 18. I’m just happy I got to be the first to see him climb out. He just called me into his room to take him to the potty, and I was standing there talking to him. He flashed a wry smile and began to survey his surroundings. Then all of a sudden, he hoisted himself up and out. As I said before, this is something that I think most parents don’t get to see when it happens the very first time. So, I think it’s pretty cool. Seeing the pride in his face as he successfully swung both legs over the top and plunked each foot down on the carpet of freedom was awesome. We exchanged high fives, cigars and discussed other techniques should he ever find himself trapped inside a crib against his own will. I got video of the encore presentation, as I was clapping and screaming for more! He did not disappoint. BTW, we are still working on doing pee pee and poopie on the same potty visit.